Preparing your space for a wine cellar - the details make the difference. ​Maintaining the ideals environmental conditions for a wine cellar requires attention to detail in preparing the wine cellar space. Achieving and maintaining those conditions will allow for proper development of your favorite wines and champagnes. By paying attention to details now, the enjoyment of your wine will be maximized and your investment will be protected far into the future. The purpose of this Wine Cellar Preparation Guide is to outline the proper wine storage conditions and provide you with the information necessary to create and maintain those conditions in a wine cellar. What are ideal wine cellar conditions? Most experts recommend an average temperature of 55 degrees Fahrenheit for all wine storage and proper wine aging. Cooler temperatures won’t damage your wine but will slow its development. Temperatures above 70 degrees will have a negative effect on wine the longer it’s stored. The storage temperatures should not be confused with the serving temperatures of wine, which are 10 degrees cooler than storage for whites and 10 degrees warmer than storage for reds. Although 55 degrees is the optimal temperature for storing wine, keeping a constant temperature is just as important as this ideal temperature. Constant temperature fluctuations are what damage wine and accelerate its aging process the most. The ideal humidity in your wine cellar should be 60­70% but anything over 50% is acceptable. High humidity, 80% or more, may cause mold to form on corks and bottles. In addition, ideal long term wine storage should avoid heat, direct light and vibration. What’s the best location for a wine cellar? 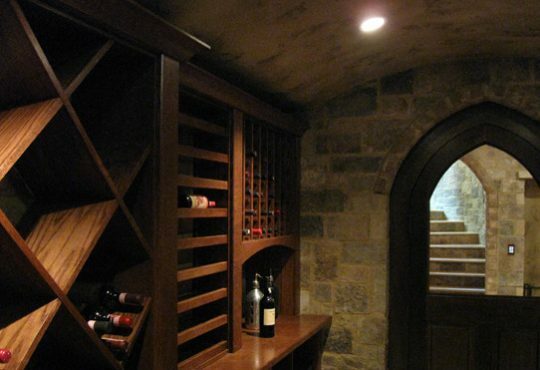 The best location for a wine cellar is below ground level in a basement. The reason for this is that the temperature is generally cooler and more humid conditions already exist. A corner of a basement, with two exterior walls and free of windows, is ideal. Wine cellars built above grade, where basements do not exist, simply require special attention and materials to properly insulate and seal the room thoroughly. What 's the best location for the cooling system? One of the most important factors in choosing a wine cellar location is deciding on the type and location of a cooling system. Most cooling units are installed through a wall and exhaust into an adjacent interior room that is at least 30% cubic feet larger than the wine cellar. The ambient temperature of the intended venting area should not be higher than 85 degrees F in order for proper operation of the cooling unit. Other cooling unit options such as split systems and special units are available and may require installation by certified HVAC Contractors. What is the proper cooling system for a wine cellar? To choose the proper cooling unit, we calculate the cubic area of your room and take into consideration the amount of insulation in the walls and ceilings. There are 2 main types of refrigeration units. The standard self­ contained units can be vented through your cellar wall to the outside or to a utility or mechanical room. There are also split cooling systems which work like central air conditioning. The condenser is installed outside your home and is connected via copper set lines to the evaporator unit inside the wine cellar. How do you prepare the walls for a wine cellar? Standard 2 x 4 framing is sufficient for wine cellar walls, however, 2 x 6 walls allow for more insulation. Electrical, HVAC and plumbing rough-­in work should be completed prior to insulation and drywall. A vapor barrier is critical in controlling the humidity of your wine cellar. The ideal humidity of your wine cellar is much greater than that of the rest of your home. A vapor barrier separates the two conditions and keeps the higher humidity from flowing out of the room. It also prevents warm and moist air (in high temperature and humidity areas) from entering the room, eliminating excess condensation and build­up from the cooling unit. A 6 mil poly/plastic should be stapled over the studs on the warm air side of the wine cellar. If done improperly, the result could be mildew and mold. The interior walls of your wine cellar should be insulated with a minimum of R­13 and preferably R­19 insulation. Ceilings should be insulated to a minimum of R­19. Poured concrete and concrete block are not acceptable wall surfaces for climate controlled wine cellars because they provide very poor insulation and vapor protection. Although a standard ½” sheet rock may be used, it is highly recommended that you use moisture resistant “green board”. Dens Armor by Georgia Pacific makes a paperless drywall that is perfect for wine cellars because, unlike most drywall, it is not vulnerable to the mold that high humidity conditions can produce. We do not recommend installing a baseboard as the racking will be flush to the entire wall and include a toe­kick molding. Acceptable interior wall surfaces: “Passive wine cellar” – raw, painted or coated concrete or concrete block as well as most interior wall materials. Active climate controlled wine cellar –Ship­lapped or T&G Cypress, Mahogany plywood, ‘greenboard’ sheetrock, Dens Armor by Georgia Pacific, stone, slate, tile, Limestone Plaster, and any material that is rated for exterior use. What's the best floor for a wine cellar? Although many floors will work, we believe cork is ideal flooring in a wine cellar. Cork provides both insulation and moisture protection from the slab below. Additionally, cork is one of the softer floors which could help in the event of a dropped bottle. 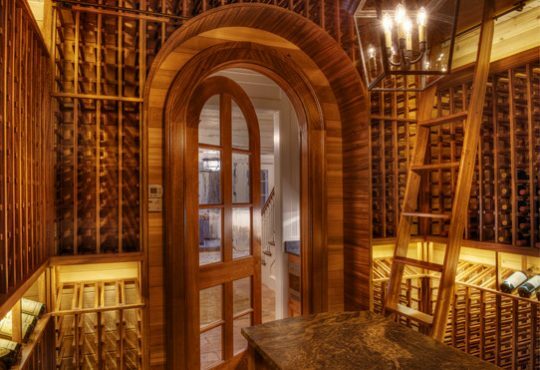 What type of door is best for a wine cellar? We recommend a solid core, exterior grade door for your wine cellar. All doors should be weather stripped and completely sealed to prevent loss of cooling and/or infiltration of warm air that will cause condensation. If you select a decorative glass door, be certain that the glass is thermo­pane and tinted. Any lighting or other electrical considerations? Electrical considerations must be made in the construction of your wine cellar. Specifically, the locations of electrical switches (in order not to be covered by racking) and location of lighting. Electrical switches should be dimmable and placed outside the room so that you can adjust the lighting without opening the cellar and releasing the cool air. Proper lighting should be low heat (if lighting will be left on) and properly insulated and installed. Lighting options include wall sconces, chandeliers, low­ voltage halogen track lighting, LED, or sealed can directional spotlights. If your wine racking is single depth, your lighting should be a minimum of 16″ from walls and 28″ from walls when double deep racking is used. Can I place a wine beverage center inside of the wine cellar? Wine cooling appliances such as beverage coolers and wine refrigerators are not recommended in a wine room because of the heat output of the compressors in these units. This heat output significantly contributes to the undesirable temperatures that damage wine and accelerate the aging process. As with all building, please consult your local building codes for more information.